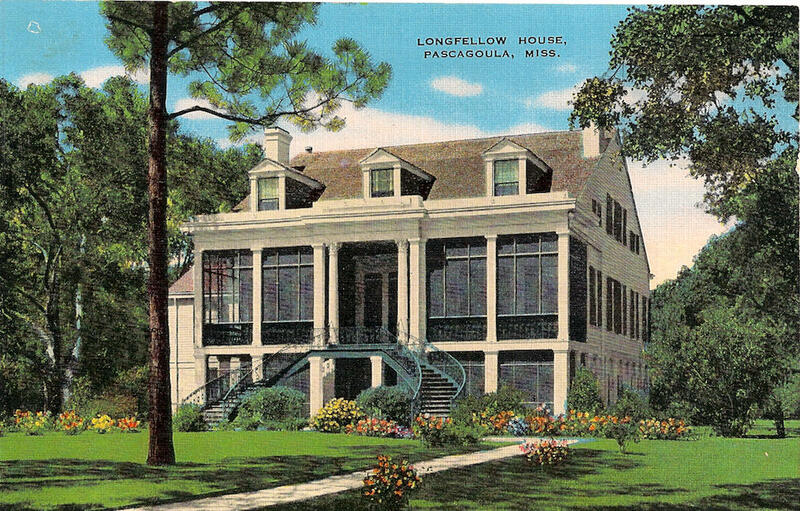 Pirates and buried treasure, a “renegade” priest, a baby falling from a third-story window, and bloodstains on floors—these are the legends that surround Pascagoula’s most treasured antebellum home, the Longfellow House. Constructed in the 1850s for the Daniel Graham family, it has long been the subject of local lore. The three-story structure originally stood on an extensive piece of property, boasting four hundred feet of waterfront land on Pascagoula Bay. Craftsmen constructed the home of native pine and cypress and topped it with a slate roof, punctuated by three dormers and two chimneys at each end. The grandest architectural feature of the house was and still is a self-supporting winding staircase that leads to the third floor. Over the years this magnificent estate has been home to many different people, generating fascinating stories about the property. The first owners, the Grahams, were slave traders with a reputation for extreme cruelty to their slaves that supposedly resulted in bloodstains on the third-story floors. The Grahams occupied the home for a time, and the house subsequently sat empty for a number of years, prompting locals to believe that it was haunted. Between 1873 and 1902 the home, known as Bellevue, changed hands at least nine times. Some owners resided on the estate, though others did not, and at one time it served as a girls’ school. The Longfellow House’s history has become quite muddled, perhaps opening the door to many of the legends surrounding it. In 1902 W. A. Pollock purchased the house. His family lived there until 1938, a longer tenure than any other family. Members of the Pollock family then sold the house to Mayor Frank Canty, who resold it just three years later to Ingalls Shipbuilding Corporation. Ingalls owned the estate for several decades and transformed it from a private residence to an exclusive club and resort. It featured all the amenities of a luxurious beachfront resort: cottages, hotel rooms, dining rooms, a lounge, a swimming pool, and a golf course. Numerous legends regarding the house have arisen, perhaps the best known of which is the one that gave the home its current name. Poet Henry Wadsworth Longfellow supposedly was visiting the estate when he was inspired by Pascagoula Bay and penned “The Building of a Ship.” Despite the authority with which locals often tell this story, it is simply a legend. The poem in question describes the process of a ship’s construction, and it does mention Pascagoula. Locals likely drew a connection to this reference and the town’s shipbuilding tradition and concluded that the poet must have witnessed shipbuilding in Pascagoula. However, a closer reading of the poem reveals that Pascagoula, one of the country’s largest exporters of timber at the time, was simply a source for the lumber used to build the ship: “Brought from regions far away, / From Pascagoula’s sunny bay.” Longfellow apparently never traveled south of Virginia, so the idea that he visited the home is simply a myth. Having taken on lives of their own, the myths have romanticized the historic home for generations and have enshrined the Longfellow House in the hearts of locals. The house is now one of the few antebellum homes left on the Mississippi Gulf Coast, a beloved community landmark and a symbol not only of local history but also of the area’s resilience.